Dr Joaquín J. Sopena has gathered together for that work a remarkable team of national and international specialists in skin surgery in small animals, presenting a versatile work on clinical cases. The book will be structured in a practical and applied manner, aiming at providing a detailed description of each case, including the surgical technique and many pictures and step-by-step series. 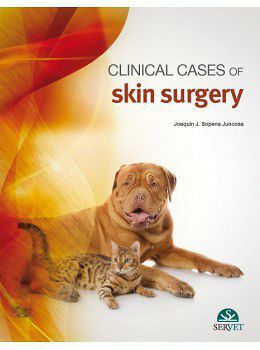 More than 30 clinical cases on skin surgery that will serve as a guide for every vet in practice confronted for the first time to similar cases. This publication will be a reference guide for those veterinary surgeons whose intention is to improve clinical management of big wounds requiring one or several surgeries.